Friday opened the door to some extreme cold and wind. The day was born a gentle albeit ugly lamb but throughout its development, as forecast, it turned mean. Negative twenty, eff, and winds nearing the century mark. This is a combination that will result in kill-you-fast windchills. Of course this was also the day we had long-slated for a dual adventure: remote access via snowmobile followed by an atypical winter climb of Mt Jefferson (5716′) via the beloved Caps Ridge Trail. Not terribly inviting, but let’s hike. 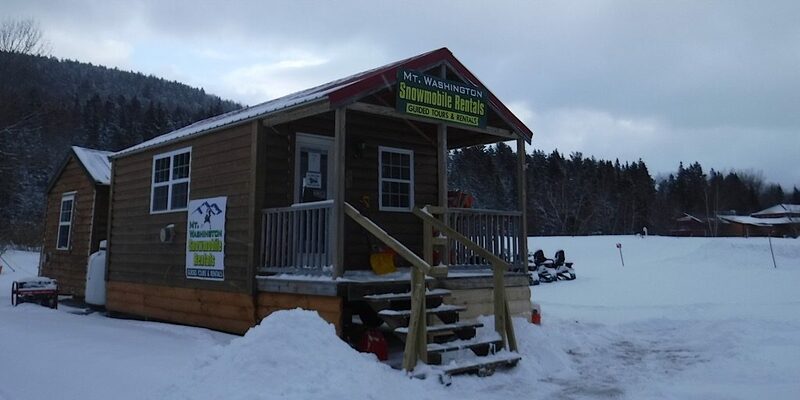 Our friends at Northern Extremes Snowmobiling. Leading today was Redline Guide and owner Mike Cherim. 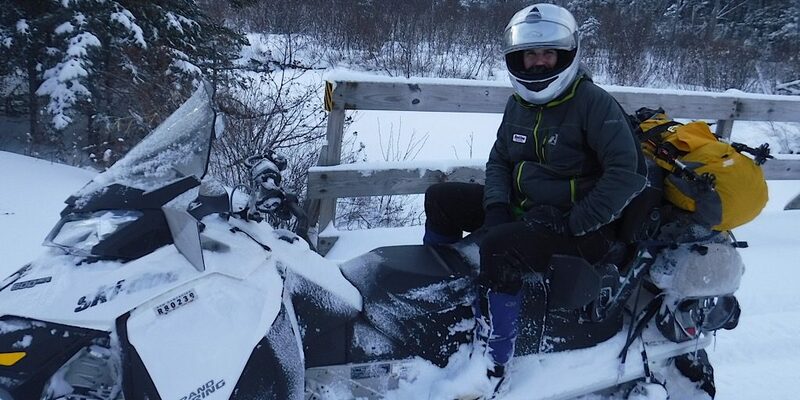 He concocted this plan years ago, and he does know how to operate a snowmobile so it being his lead was a given. That said, he often gets these off-the-hook days. Just lucky. With him we had a single returning guest from last year, Brian. 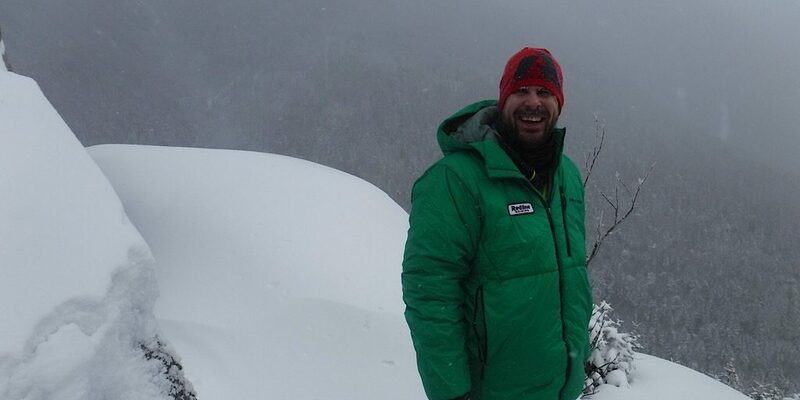 A New Yorker and an accomplished boxer, Brian likes to test himself, to challenge his discomfort with heights while relishing the alpine experience. Brian has summited some big mountains out west and in South America, but this combination intrigued him nonetheless. Our chariot of the snow. We could park any way we wanted to. 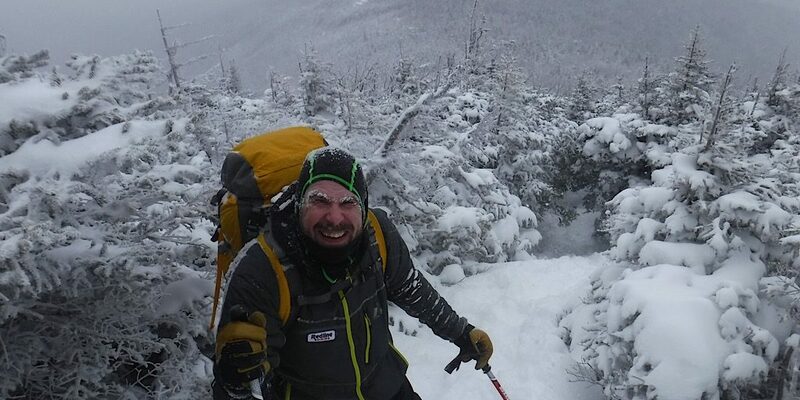 Brian was staying in Vermont as he will be hiking Camel’s Hump with us Sunday — so we met him at the Northern Extremes Snowmobiling office in Bretton Woods. They’re located right next to the Irving Station, and situated perfectly to make our plan a reality. 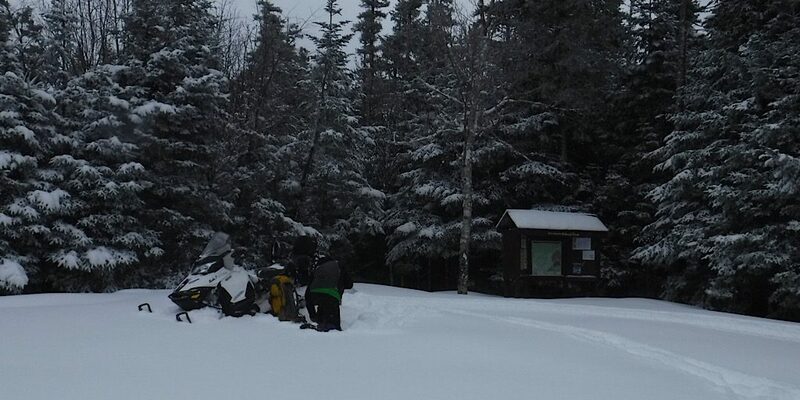 Park there, take a snowmobile on a trail that runs along Base Road (crossing it five times), take a left onto Jefferson Notch Road which isn’t maintained in winter, then park like we own the lot at the Caps Ridge trailhead. No problem, they said. They were very accommodating. Our plan was a go, at least on this front. 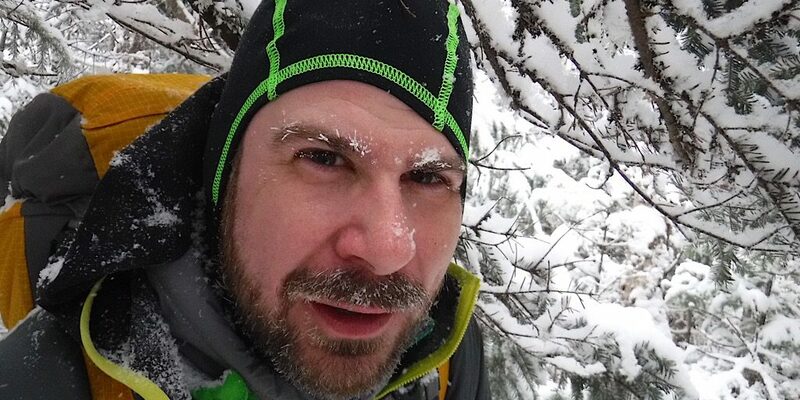 Caps Ridge Trail… in winter. It’s pretty out what with all the new snow. We start in. 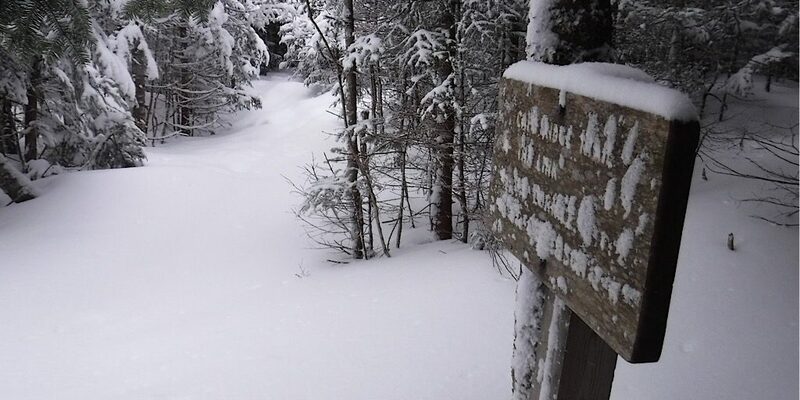 It’s difficult to see in this photo, but this trail was previously and surprisingly broken out. 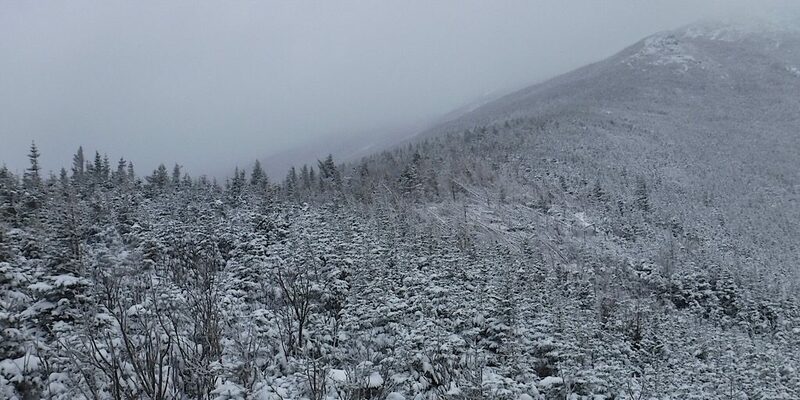 The day started out mild with a fresh blanket of snow winterizing the scene in Bretton Woods. 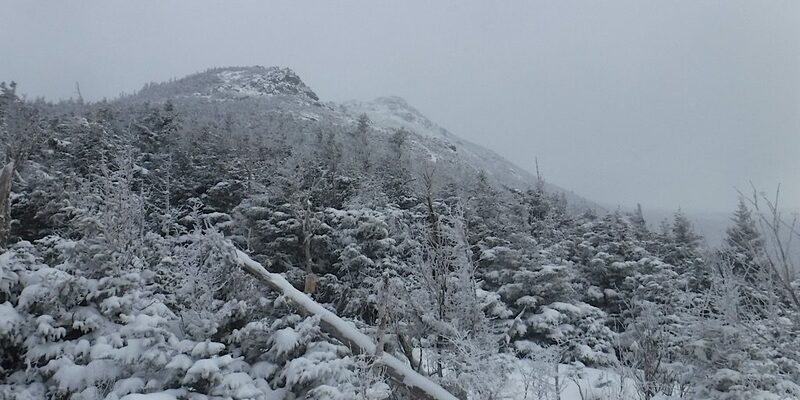 The sky was gloomy and uninviting, but the fresh snow was pretty and it meant our ride would be smooth and safer than the ice that had forced operations to close up there for a bit just prior. After getting their tandem machine and helmets, and an awkward start on the wrong side of the tracks, whoops, they took off down the trail toward their goal. The big chill is yet to come, but for now let’s be frosty. Before long they arrived and dismounted, stashing the helmets in the woods, protected in a white trash compactor bag. 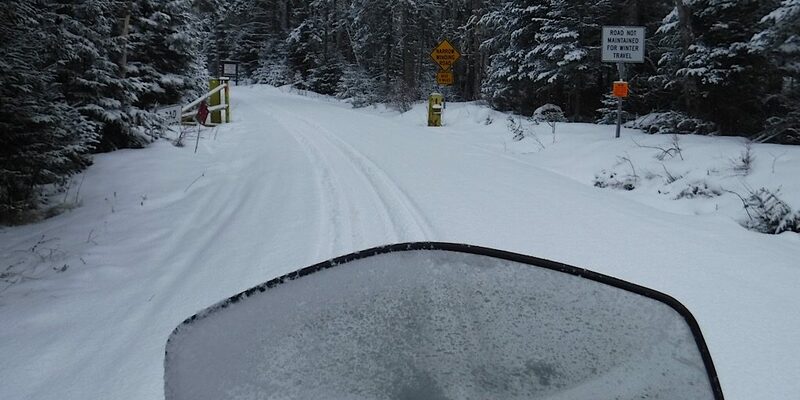 It was a fun ride, especially the notch road, though a bit chilling for Brian in the most literal sense. It seems he wasn’t feeling 100% and felt unusually cold (we checked for fever but there was none that we could tell). 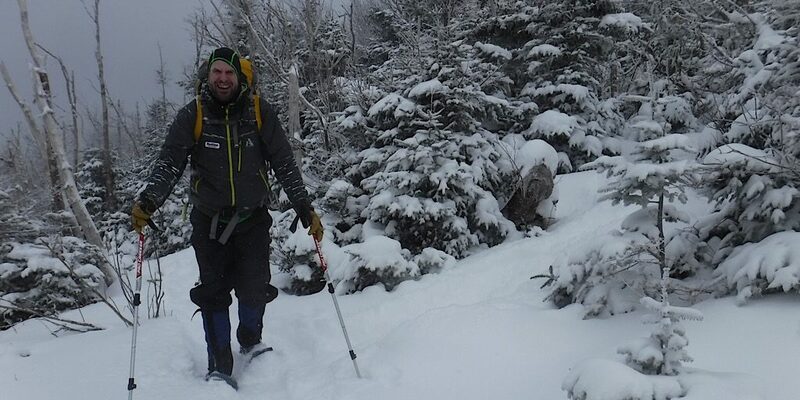 We figured the best way to fix the chills is to get moving so we put on snowshoes and started hiking. 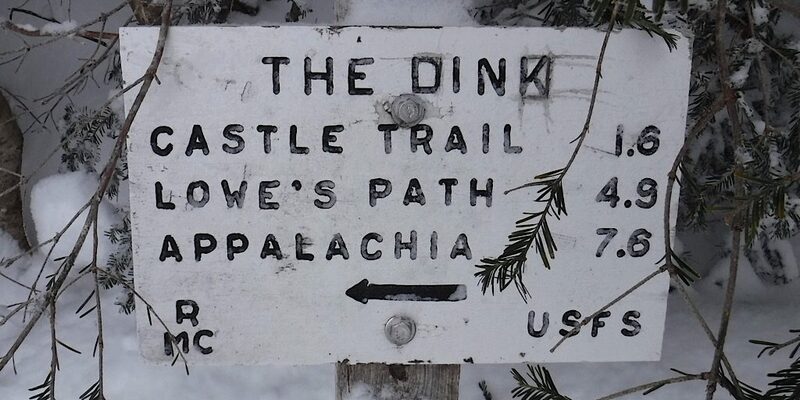 We noted someone else had been on this trail this winter as we started; so much for being original! 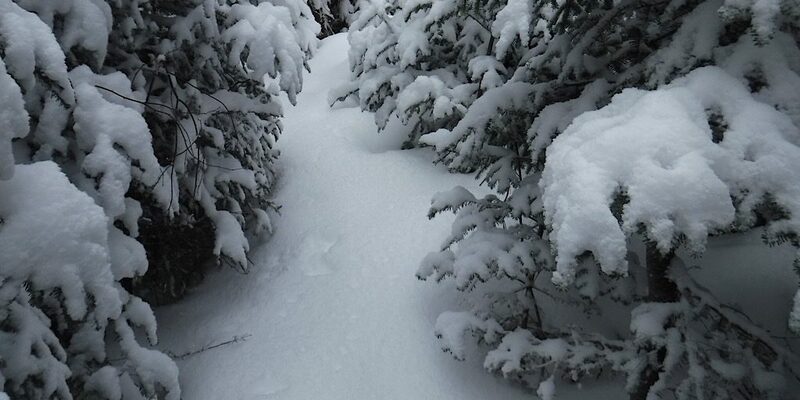 The fresh snow, however, meant we still got to enjoy some trail breaking. Limited view, but stunning nonetheless. The way ahead, Caps in sight. Mike led the way, but Brian still got plenty of effort in what with the snow, the five or six blowdowns they encountered, and a lot of brushed-in winter trail to bust through. Yet, despite this, he wasn’t warming up. 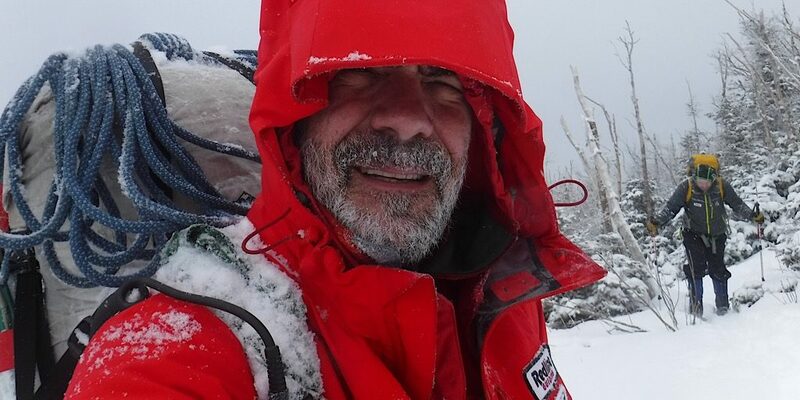 Mike noted a shiver: stage one hypothermia, but no umbles, yet. The two continued on, waiting for that time when Brian would warm up, but he never really did. 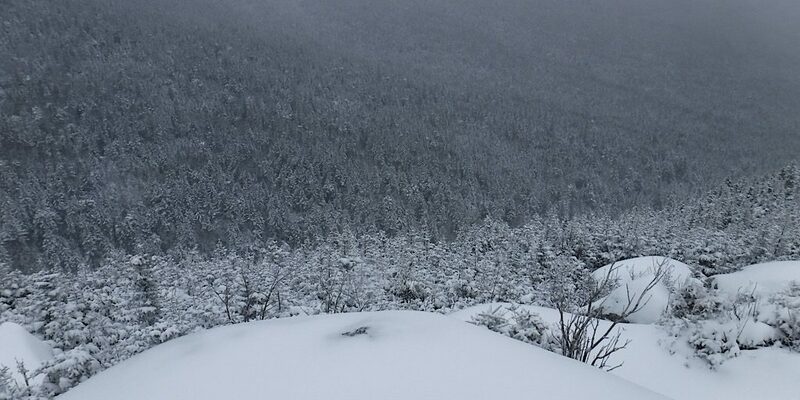 At treeline, pretty much at the base of the first cap and pretty much where they expected to be ending this thing anyway thanks to the forecast. Brian tapped out as they say in the fight world, threw in the towel. It was going end anyway; going ahead wouldn’t have been hard, but we feared the return trip might be too much trial and not enough fun. Winds were building out of the west. They would have been in the face coming back. Not good. 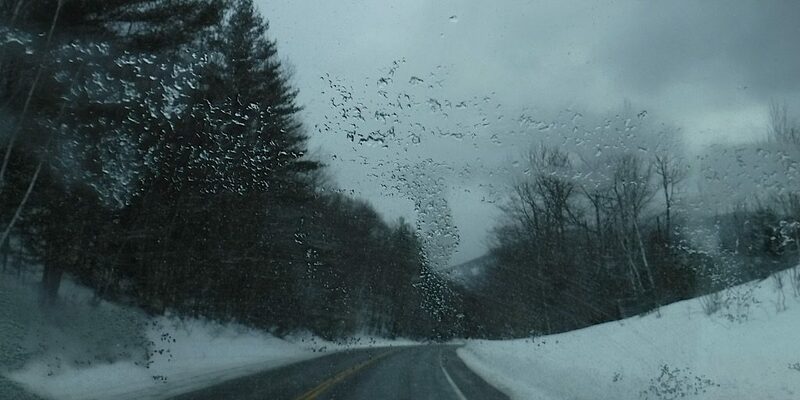 Moreover, the temperatures were steadily and quickly dropping. Time to go back. The Link is an awesome trail. It is not deserving this edit. Caps in view, still going up. Brian is chilled but in good spirits. They descended then retuned to the start. Brian finally warmed slightly coming down but cooled off once again on the ride back. They both did. By this time the difference between the starting temps and the finishing temps in the afternoon were shocking. They were totally prepared, but nobody really wins when it’s well below zero. The call to end was sound. 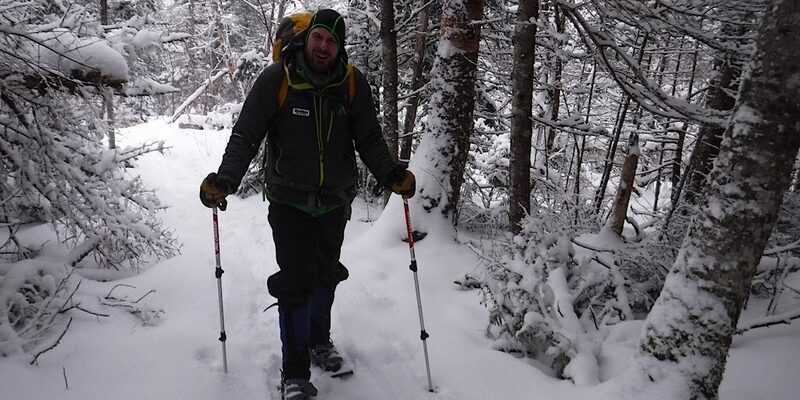 Brian mentioned he might come back this summer to tackle the same trail with us on a warm, sunny day. First, though, he must convince his wife the North Conway outlets are worth a visit. Note the love. Thanks for wearing our patches, Brian. Next time, Brian. Well done, team! 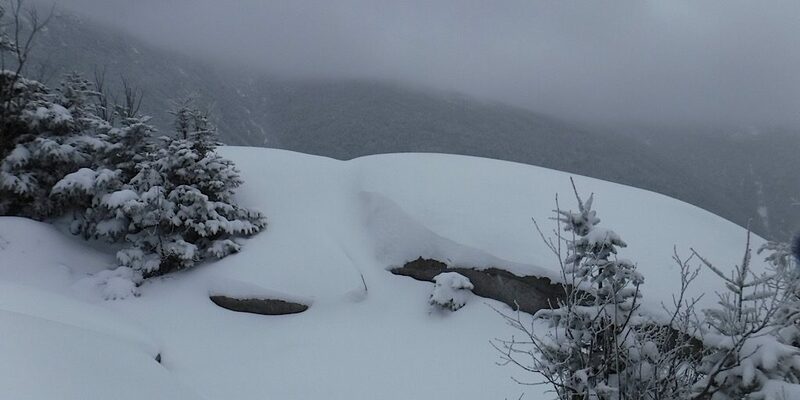 Oh, and good luck on Camel’s Hump.